Dipole and monopole antennas are widely used in wireless communications equipment due to their simplicity, omnidirectional characteristics, and low cost. 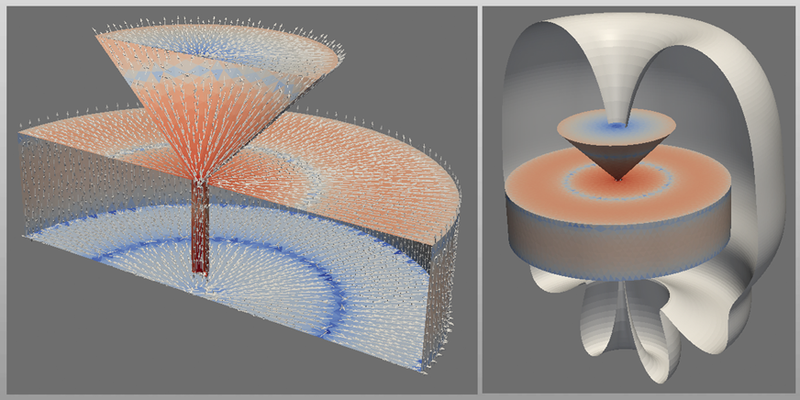 Wave3D software simulates such antennas within the framework of a general 3D analysis. This preserves accuracy of computed field for designs featuring both small and intermediate ratios of antenna radius to its length. Below Wave3D simulation results are presented for broadband conical monopole antenna as well as conventional dipole antenna. Y. K. Yu and J. Li, “Analysis of electrically small size conical antennas”, Progress in Electromagnetics Research Letters, Vol. 1, pp. 85-92, 2008. Fig. 1a: Instantaneous current distribution at t=0 s (left) and radiation pattern (right) of a monopole conical antenna fed by the coaxial cable at 500MHz. Ground plane radius is 60cm. Radius of cone radiator and its height are 15cm. The radius of coaxial line inner conductor is 1cm. Fig. 1b: Instantaneous current distribution at t=0 s (left) and radiation pattern (right) of a monopole conical antenna fed by the coaxial cable at 900MHz. Fig. 1c: Instantaneous distribution of the near field in the vertical slice across the conical monopole antenna at 500MHz (left) and 900MHz (right). Fig. 1d: Reflection loss of the conical antenna in the frequency range 100-900MHz. The S11 is calculated with normalization to 50 Ohm. Dipole antennas are commonly made of a solid wire with the radius substantially smaller than it length. While thin wire models of such antennas provide good approximation of the fields, thicker dipoles often require fully 3D modeling for accurate prediction of their input impedance and radiating properties. Below the numerical results computed with Wave3D are demonstrated for 1/4-wavelength and 3/4 wavelength dipole antenna featuring 1:100 diameter to length ratio. Fig. 2a: Snapshot at t=0 s of time-harmonic magnetic field (left) and electric field (right) in the longitudinal and cross-sectional slices near 1/4-wavelength long dipole antenna. Diameter of the antenna is 0.01 of its length. Fig. 2b: Snapshot at t=0 s of time-harmonic magnetic field (left) and electric field (right) in the longitudinal and cross-sectional slices near 3/4-wavelength long dipole antenna. Diameter of the antenna is 0.01 of its length.